Apart from human and material losses, the Second World War inflicted enormous cultural losses on Poland, with the destruction of works of art as well as books. Its most telling symbol is an urn with ashes collected from the Okólnik library, a treasure trove of national heritage at the time of the war. Bownik's photograph captures one moment of the perilous process which began in the fires of "bookicide". We do not know, and we will never find out, what book makes up the urn's contents. The urn now stands in the Wilanowska hall of the Palace of the Polish Republic, by Krasiński square in Warsaw. A glass cabinet contains a form in which we recognise the shape of a petrified, charred volume, surrounded by the lumps of ash that it is dwindling to. We also do not know how long the contents of the urn will maintain its present form, as micromovements and oscillations make the sensitive matter slowly crumble away. It seems like it's a matter of a few decades until its form will no longer be recognisable at all. What we do know, is that this fragment was rescued from a true cemetery of books, which the Krasiński Library headquarters in Warsaw had become after the fall of the Warsaw Uprising. The urn is a symbolic memento of wartime history, specifically the endeavour of what Bohdan Korzeniowski had labelled an organised "bookicide". As it turns out, this most significant collection gathered at 9 Okólnik street did not burn during military action or during the Warsaw Uprising. And, although books apparently don't burn very well, the example of Warsaw suggests something quite contrary. From 1930, the Krasiński Library had its headquarters at a newly raised palace at 9 Okólnik street. Yet, its history dates all the way back to 1844. It was then that Wincenty Krasiński, the father of the Romantic poet Zygmunt Krasiński, founded a library in Opinogóra, the family's estate in a village in Ciechanów County, Masovian Voivodeship, in central-eastern Poland . The library, which included the family archives of the Krasińskis, as well as marvellous collections of old prints, manuscripts, and maps, came to also include the museum collection of Konstanty Świdziński in 1860. Together with the Zamoyski family Library and the Przeździecki family library, it was one of the finest national collections of books and manuscripts and a highly significant part of the Polish cultural heritage. This is also how its founders and its subsequent ordinators conceived its role and function – an element of national heritage. The first blows of the war fell on Okólnik in September, 1939, during the siege of Warsaw. The bombs which fell on the palace on the 24th and 25th of September destroyed the central, ceremonial part of the building. The museum expositions and the library hall suffered from the attack, but the collection stowed away in storage remained intact. In the autumn, the SS Commando Paulsen stole priceless objects from the museum's stores, and in February, 1940, Josef Muhlmann's commission requisitioned some museum items. A few months later, musical rarities were commandeered for the NSDAP Higher School which was being founded in the Reich. The oldest score of Polish polyphonic music, the early 15th century compositions by Mikołaj of Radom, found itself among the appropriated manuscripts. In spite of these requisitions and damages, the true beginning of the end of this grand familial collection is connected with the project of incorporating it into the Staatsbibliothek Warschau. It was a library founded by the Nazi occupiers in July, 1940, and created by merging Poland's two grandest book collections, the National Library (which was located on 6 Rakowiecka street) and the University Library. 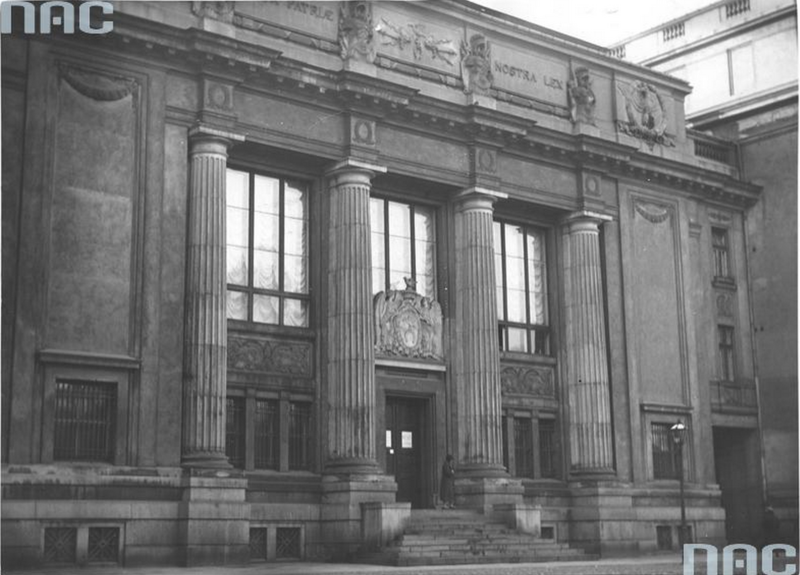 The incorporation of Krasiński Library into Staatsbibliothek Warschau took place in May 1941, despite the librarians' protests. The Krasiński Library collection was split into two and divided between two sections of the Staatsbibliothek Warschau: Abteilung I (the University Library) and Abteilung II (the National Library). The next year saw the collections displaced and merged , and the result was that the special collection of the University and National Libraries found themselves in the Okólnik palace. When the project of transporting and redistributing collections among the three libraries was complete, by the month of May, 1942, the special collection in Okólnik was made up of a total of 388-400 thousand items - probably the most precious collection of books on Polish territory. The first month of the Uprising (which started on the 1st of August, 1944) brought about almost no destruction. It was on the 5th of September that the first bombs fell onto the Okólnik building, which had been turned into the headquarters of the Department of Internal Affairs, in spite of the librarians' protests. The stores were bombarded, and the fire which started up devoured a part of the collection. On the fourth floor, 16th and 17th century prints burned; on the third floor perished the Czetwertyńscy Library collection from Milanów, together with the remains of old prints and musical scores which had not been transported into the basements. The second floor saw the destruction of manuscripts from the 19th and 20th centuries. A part of the collection was saved when books were tossed out of the windows onto the courtyard. Those who were trying to save the collection fought for a full 24 hours before leaving the charred rubble. The ground floor, with manuscripts from the Krasiński collection, still remained intact. And the basements kept preserved the most precious items, with manuscripts of the University and National Libraries, as well as long-kept deposits. Packages from the Polish Library in Paris also remained untouched. These survived through to the end of the Uprising, and even a little bit past it. A few days after the tragic fall of the Uprising, and definitely before the 14th of October, 1944, the Brandkommando division set fire to the remaining collection of the Okólnik palace. According to the researcher Hanna Łaskarzewska, as a result of the September bombings and the premeditated destruction in October 1944 the total tally of destruction counted nearly 80 thousand old prints (mostly precious Polish documents from 16th-18th centuries), 26 thousand manuscripts, 2500 incunabula (earliest printed matter dating back to before 1500 AD), 100 thousand drawings and etchings, 50 thousand musical and theatre scores, a rich cartographic collection, and some of the catalogues and inventories. In the fires of Okólnik, the biggest harm, both in terms of quality and quantity, was suffered by the National Library collection. All of the cimelia, special collections and the Krasiński Library documents were destroyed there. The overall damage to the Krasiński Library was estimated to be some 150 thousand pieces, with a number well exceeding 50 thousand having been burned in Okólnik. The jewels in the crown of the literary collection – apart from manuscripts which dated back to the 16th century – were the fragments of the manuscript of Adam Mickiewicz's Pan Tadeusz, as well as the rich materials of Juliusz Słowacki's original writings and the heritage of Zygmunt Krasiński. The latter encompassed his correspondence, his school essays, exercises and his transcriptions. All of this was destroyed. The sole materials to have survived from the Krasiński family collection were those earlier incorporated into the University Library and National Library collections as part of the Staatsbibliothek Warschau. During the Uprising, the Germans burned nearly the entire Library of the Warsaw Polytechnic. The director of the institution during the occupation, Czesław Gutry, found this out when he arrived at the Polytechnic in early October. He stepped into a nearly 1-metre high layer of ash – made out of the 90 thousand volumes of the maternal library, 5 tonnes of the Ministry of Communication Library, and many other institutional collections. The Germans burned Polish libraries right to the end, as they made good on the threat that they had declared during negotiations after the fall of the Uprising – "What isn't transported out of the city will be burned down". 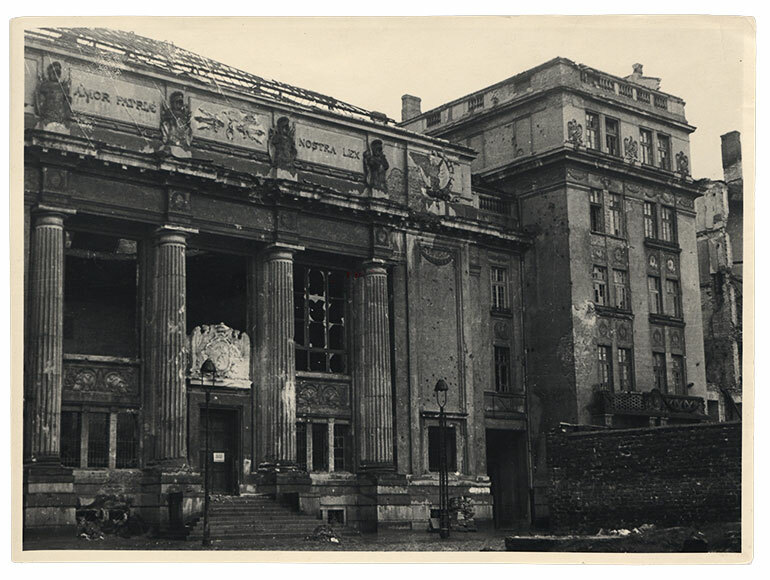 Just two hours before leaving Warsaw, in mid-January 1945, German soldiers set the lower floors of the Public Library on Koszykowa street aflame, where the resulting fire destroyed more than 300 thousand volumes. Altogether, the biggest scientific libraries in Warsaw lost a total of some 1,620,000 units, which constituted about 50% of their pre-war collection. My collector's passion, which I possessed from my early childhood, was ripped out of me by the Uprising. Now I don't collect anything. I even stopped writing my diary, even though I used to do it for no more or less than 41 years without a break. When now, upon entering the ruins of Okólnik, I saw the sky shine through empty windows in the charred walls of the library, I didn't yet lose hope. The solid Wertheimer ceiling could have been able to not only withstand the weight of the falling floors, but also to protect the collection from the burning heat. How many Warsaw basements preserved hidden treasures, even though the homes had turned to charred rubble? The way down to the basements was blocked with wreckage. So I made it into the dungeon. At a first glance, one could experience a stunning sense of joy. "Oh, yes!" one wanted to cry out, "The collection has survived!" It laid there in thick, even layers. The sense of order was even somewhat striking, an order that we did not leave behind when we were masking the entrance to the shelter. There were no metal sheets, and no sandbags. The much lower level of the layers also caught one's attention. The volumes were no longer stuffed together tightly and touching the ceiling, as when we stored them. A closer approach revealed the secret behind these changes. It was disgusting. When one touched the layer of those stored units, they did not even disintegrate. They vanished. The collection smouldered completely in a fire that must have been digesting it slowly for many days. It is one of those charred books from Okólnik which was put into an urn seventy years ago, and is now mounted in the Palace of the Republic, reminding us of the wartime destruction of books. The urn, which usually stands in a shaded corner of the National Library, will be on display as an enlarged, large-format photograph, as captured by the artist Bownik. Bownik | Urna from STARTER Gallery on Vimeo. Such a magnification brings to mind nature photography, images that present a scaled up picture of an anthill, for example. In this way, it depicts the complicated life which escapes the human eye. Yet, in this case, it is not the insects that are at work, but time, and we observe the process of decay. The charred book is disappearing in front of our eyes. We peek inside through a microscope. The hourglass works, grain by grain. The paradox is that nothing is crumbling on the photograph, and time stands still – because of the impression of reality, and the magnification, it's easy to forget this. In a way, we submit to the illusion, one similar to what Korzeniowski had experienced.